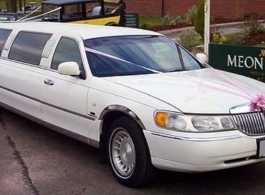 Stretch Limousine for Weddings, Hen Nights, Birthdays, Proms or any other special occasion. The White, 8 seat stretch Limousines are ideal wedding vehicles for bride or groom or for the bridesmaids, pageboys, ushers, family, friends etc. With Black leather seating, a full length bar, glassware, subtle mood lighting, music system and air conditioning, this is a fantastic way of celebrating your event. Please note there are 2 Limousines, one is all White and the other is White with a Black roof, the Limousine you book will be one of these.